If you are thinking about having a garage sale to off-load your clutter here are a few pointers you might find helpful. Choose Wisely: Only include clean, usable items that don’t look like they should have gone in the dumpster. If you have some items that are still useful but a little neglected give them a bit of a clean up before putting them on display. Stickers: Write the price clearly on small stickers and place on each item. Colour coding: Sort you items into price groups. Using a pack of mutli-coloured stickers allot a value to each colour according to your groupings. Place the approcriate coloured sticker on each item according to the price you hope to fetch then make up a couple of charts depicting the colour code for the customers to read. You may need to resort to the first option for the odd items that won’t fit into a group for some reason eg. higher priced items. Group items according to price and make up signs to place at each price point. The problem with this method is if people move things around, and they will. Note: I hate going to garage sales that don’t clearly mark prices. You then have to ask every time you want to know the price of an item. Be Flexable: Be prepared to be flexable with your prices because people will haggle. Convenience: Have some old shopping bags handy to make it easy for the customer to carry their purchases as they may be on foot or had to park a little way away. Maybe some newspaper of similar would be useful for wrapping breakable items. Change: Make sure you have plenty of coins and small notes available as people don’t always have the correct money. It would be a shame to lose a sale because you couldn’t make change. Set up: Have all items selected and priced ahead of the day. Park your cars on the street and set up the sale in your garage the night before. This way on the morning of the sale you will be able to quickly do your last minute prep work and be ready to sell almost immediately. There are usually a couple of vulrures out there ready to pounce the minute they see any sign of life. These early customers are often your best customers. Start time: I alway think a nice early start is the best way to go. As early as 7am because keen garage sale addicts are often out early to get the bargains and quite often have had enough by midday because they have other things to do with their lives, as have you. What Day: Saturday is usually the best day to have a garage sale. If you are keen and have a lot to sell have it over two days, Friday and SaturdayI feel are best for this strategy. You get the eager beavers on Friday and still a good batch of keen garage salers on the Saturday. Often people are over it by Sunday. If the first day of the two day sale is going well you can always raid the house overnight and add more items for the second day and clean up even more clutter. Advertising: It usually pays to advertise. The local free paper that gets dumped on everyones lawn is often the best option but the most popluar local sold paper is also good. I have had garage sales where I haven’t advertised at all and done very well, all it takes is a few strategicly place signs on the streets near by to attract customers. Signs: Clear bold print stating GARAGE SALE or YARD SALE with a hugh arrow pointing the way is realy all you need. People going by in cars only have time to register that much information before it’s too late to change direction.Make enough signs to reach out to the nearest busy road so you attract plenty of potential customers. Keep in mind that in some places it is illegal to place these signs but I have always found that so long as you remove them as soon as you are done there usually isn’t a problem. Note: As mentioned above please remove all signs you have posted as soon as the sale of over. You or your neighbours don’t want people prowling up and down your street for the next couple of weeks looking for a nonexistant garage sale. Not to mention that old signs just make the neighbourhood look untidy and no-one wants that. Presentation: You don’t want the sale to look like a complete shambles making it diffiult for the customers to view your merchandise. Group like items together ie. gardening tool, glass & china etc, electronic items, toys, car parts… Items such as clothing are best sorted into groups of ladies, mens, children according to age/size and hang all large items. People often won’t bother sorting through huge hampers of crumpled up clothing because 1. it looks like the clothing isn’t well looked after and 2.it’s just to much trouble. Get together with a friend to have your sale. This is a great idea for several reasons..
You can share the set up work and the cost of advertising. You can take it in shifts to man the sale so you are still able to get the kids to their sporting events etc. Also you will have more merchandise which gives the sale curb appeal, that is it looks more intresting from the street making potential customers more likely to stop in because of the large selection. Advertising costs shared with a large group gives you scope to afford more ads over a longer period giving customers prior warning so they can pan ahead to be there. More interest to lure potential passing customers. People will come from far and wide if it is worth there while due to multiple sales in one trip. This is where the extra advertising pays off. You can still join with a friend under these cercumstances so you still have all the advantanges mentioned above. I hope these tips have been helpful and good luck to anyone who decides to give the garage sale idea a go. Today’s contriution to the 365 things are these gel pens. 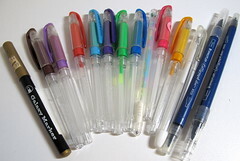 I have found gel pens do not shelve well and soon dry up when not being used which is the case here, so in the bin they go. To clean ceiling fans I aways find that damp paper towel is the best option. Take a roll of paper towel and a spray bottle of water up the ladder with you and you don’t need to come down until the job is done. It eliminates the need to rinse clothes which causes several trips up and down the ladder and a huge waste of water. Buy recycled paper towel if it makes you better about your impact on the environment. Thanks for dropping by. I hope you stick with me on my quest and hopefully I won’t run out of useful advice and tips. This post was very helpful! Stopped by to check it out from the Unclutterer Forums. glad I could be of help. I have put on quite a few garage sales in my time and used to frequent them as well once which probably explains some of the clutter around here. I always feel more comfortable at a well organised garage sales where you can see everything easily and don’t have to ask for the price. I am not shy and timid, I don’t mind haggling but I like to know my starting point.